Are you one of those diners who likes to control every culinary decision, or are you happiest when you can leave the menu to the chef? 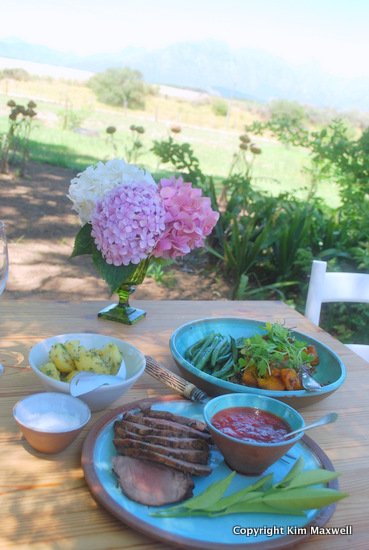 If you’re in the second category, you’ll really enjoy the eating experience dished up by Camilla and brother Jason Comins at Overgaauw Restaurant in rural Stellenbosch. 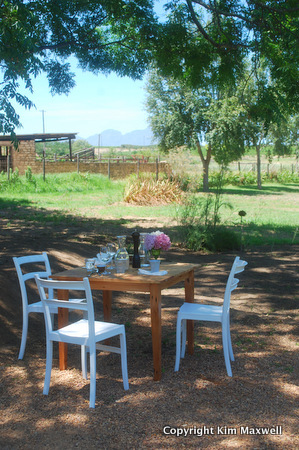 You may remember The Table at De Meye, a similar concept run by Camilla and photographer husband Russel Wasserfall in Paarl. Following a similar philosophy, new Overgaauw Restaurant opened in December 2013, and the setting is rustic and serene. Jason has taken on a more hands-on kitchen roll and Russel only helps out with service. An old farm building where vinegar was previously made has tables on the verandah and outside lawns. Three courses of dishes are served and these change often because the growing queue of regulars don’t want to get bored. It’s classic food with a few country twists, at a set price. Cooking demos for small groups are also planned, and in the off season there will be occasional winemaker dinners. 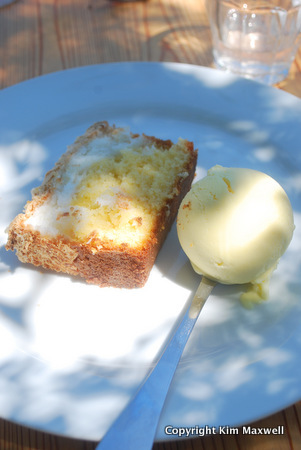 Our shady outdoor meal on bare oak tables started with home-baked bread and farm butter, the flowers arranged by Camilla. The cooking and kitchen planning is shared between Jason and Camilla. She’s self-taught with experience as a food stylist and product developer, while he trained at Ireland’s Ballymaloe Cookery School and clocked up work experience at a few restaurants. This duo’s greatest culinary preparation was growing up on a self-sufficient family farm in Vryheid in northern KZN. There they baked bread, gathered eggs, made butter, sausages, biltong and pickles and even hunted and fished. 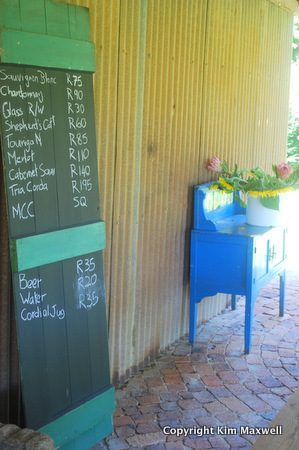 Wines – listed on a board – are well-priced and all from the Overgaauw cellar. We kicked off with glasses of Sauvignon Blanc (R30 a glass for any white or red), and had pleasant Sheperd’s Cottage Cab Merlot red with the main dishes. 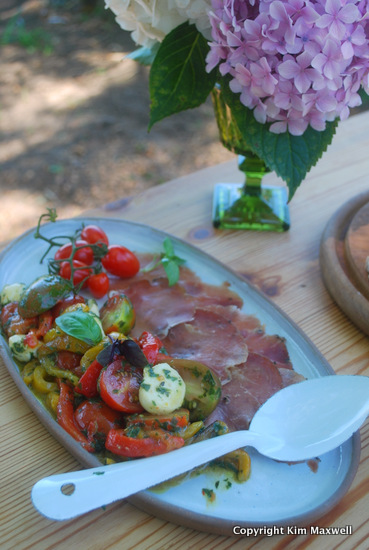 After nibbling on too many slices of bread, we were brought a colourful platter of assorted tomatoes (some on the vine grown a few metres from our table) in a herby tumble of bocconcini mozzarella balls with roasted red and yellow peppers in Overgaauw white wine vinegar vinaigrette. To offset the vinegar acid, slivers of smoky Italian-style cured and aged pork loin. We polished it off. Main dishes are both bountiful and beautiful. Deboned lamb, marinated in oregano herbs, lemon and olive oil before roasting. Jason’s cold sweet chilli tomato chutney – many of his chutneys and pickles are on sale too – and elegant green beans. Jason’s Irish herby potato salad provided homely flavours, with a deliciously earthy lentil, roasted butternut and chilli (so mild I couldn’t find any bite to be honest) salad freshened by micro herbs. I like the attention to detail and support for small producers and entrepreneurs at Overgaauw. I was told on which Paarl farm the lamb was grass-fed and reared, and also where the bocconcini and tomatoes were bought from. Unsurprisingly there is no mass-brand cola on offer. Only water or a refreshing carafe of sparkling water with a dash of Wellington producer Wilde at Heart’s Victorian rose geranium cordial, or traditional lemonade. There are a couple of craft beers if you don’t fancy wine. The dessert of the day was a slice of dried coconut macaroon cake, its white and yellow patterns defined by the baking separation. A mildly mango ice-cream added a sunny outlook to the afternoon. Children under four can find enough to eat on their parents’ platters, but ours was delighted to be offered his own bowl of chocolate ice-cream (his mom had momentary food envy after trying a spoonful). At Overgaauw there’s no fancy machine producing Americano coffees with crema, but you can finish off a meal with simple filter coffee and a bucolic view. In keeping with the people and place, this is an honest and homespun eating experience.